It’s obvious when you know…. Much of getting things done and making things happen is about getting organised, so as to reduce cognitive load. (I will do more blogs on this subject later). In many ways I owe many thanks to my French teacher, Father McGoff, who was a French Canadian and his mantra to us was “got to get organised”. (Its such a pity I did not take this lesson on board at the time). One of the most powerful tools to do this are checklists. Checklists are one of the simplest and most amazing tools and techniques you can use. The more complex the task, the more useful it is to break it down, and checklists help in the process. It simplifies things and makes sure nothing is forgotten. It is incredible how such a simple tool can reduce the effort, save time and improve quality. (At this point you are saying “boring”… but please bear with me). I have found it the simplest thing to do (and you can use a variety of tools to create them, they can be paper based or online/automated. Checklists are the most important thing, be it health and safety, packing lists, product quality, the list is endless (you could even make a checklist of checklists…. (think of them as simplified and routine to do’s or task list)). So if your business does not have it, make one for as many things and ask your teams to follow them to the letter. I first came across checklists when I was training to be a pilot. (Flying was my hobby and passion and I started it when I was 16). 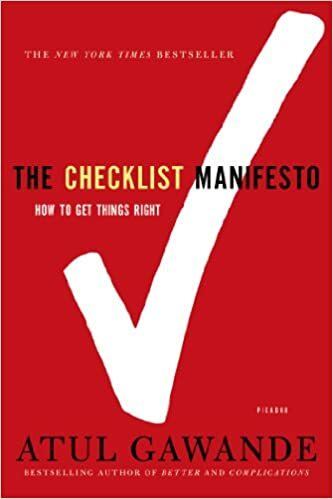 Undoubtedly checklists and the whole culture of planning (flight plans), documentation, audit trails, safety, training, testing, understanding human factors, information capture, simulation, practise, and finding why things go wrong when they do makes flying one of the safest industries in the world and a great model to put into practise for your own business. Good pilots go through their checklists with even more ritual and dedication than a hindu priest saying prayers or blessing. No matter how good your memory, you follow your checklist (we even say “check” aloud) to confirm every single item on the list. Checklists have now started to be implemented in areas such as hospitals and healthcare, and have made a significant improvement in patient care, reduced costs and making life easier for staff. This is an excellent book, and one of the books I would recommend.